More info:Price (per person) based on 2 people sharing a room for 6 nights on a bed & breakfast basis, plus ferry crossings from Scrabster to Orkney, Orkney to Shetland and Shetland to Aberdeen, a boat trip on Shetland, and a Historic Scotland Explorer Pass. Orkney and Shetland holidays can feel a little overwhelming as they are so far away, and also there are so many things to see it is hard to know where to start. Which is why we created this itinerary for a self-drive holiday, with three days in Orkney and two full days on Shetland. On our Orkney and Shetland holidays there are also options to discover some of the other smaller islands such as Hoy, Westray, or Stronsay off Orkney, or Unst and Yell off Shetland, as this is a tailor made holiday, so we can fit it around your interests and wishlists. The trip starts in Scrabster on the mainland west coast, where you catch the ferry to Orkney, a ninety minute journey. 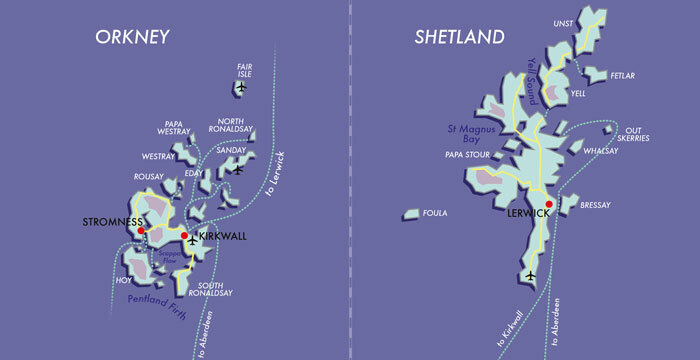 Head to the island’s capital, Kirkwall, to check into your hotel. With a few days to enjoy the island, we recommend Orphir as an excellent starting point, where the pretty round church and Viking interpretive centre, known as "Orkneyinga", are perfect places to introduce you to the ancient history of this island. A history that goes back a long way as you will see, for example, on the island’s west coast at Skara Brae, one of the best-preserved Neolithic settlements in Europe. Other natural highlights on your road trip around Orkney include Evie and the broch of Gurness, a broch being the Scottish word for a prehistoric circular stone tower. Another must see is the Neolithic cairn and passage grave at Maes Howe, as well as the standing stones of Stenness. One of our favourite spots is the famous Italian chapel, a tiny and highly ornate church at Lamb Holm, built during WWII by Italian prisoners of war who were on the island with the given task to build the Churchill Barriers. These are four causeways that link different islands in the chain. You may also want to take some time to ferry out to one of the small Orkney Islands such as Hoy, a much more rugged island famous for its sea stack – the Old Man of Hoy. Each island offers something special, however, and we are happy to advise on each. You will spend two days on Shetland, accessible by overnight ferry, but arriving in time for breakfast on board the ship, and then leaving you all day to enjoy this second island adventure. Your base is in the island’s capital, Lerwick, and the first adventure will be an afternoon’s wildlife boat trip. Thousands of seabirds including gannets, guillemots and kittiwakes nest and feed in the Noss Nature Reserve. As you sail below, the screeching is deafening, and you’ll feel very outnumbered, a stranger invading their territory. Meanwhile seals laze on rocks beneath the cliffs or nose around the boat. It is a wonderful way to get a real feel for both the culture and the wildlife of these islands, with knowledgeable guides on hand to inform. From your base in Lerwick, you will have plenty of time to explore other parts of the island, drive around its coastal magnificence, not missing the beaches at St. Ninian’s or the stunning prehistoric archaeological site at Jarlshof. More historic remains are to be found on a quick boat ride to Mousa, where birds and seals are the only stewards left to guard the magnificent ancient broch here. Your return journey is by ferry from Lerwick to Aberdeen, travelling Cruise Class in an outer cabin, and arriving in time for breakfast. We are committed to helping our clients 'see Scotland differently', and that’s why we take great pride in showcasing the natural beauty and rich heritage of each of these magical islands as well as the inhabiting wildlife on both Orkney and Shetland. On the 'seals and seabirds' trip whilst on Shetland, guests will not only view wildlife in a responsible way but will benefit from first-hand knowledge from expert - Dr. Jonathan Wills who will be on hand to share his in depth knowledge of some of the islands’ most spectacular wildlife; from gannets to seals. Moreover, as much of the long distance travel is by boat (rather than plane or car for example), it's a more sustainable way to travel and gives employment to local ferry companies. It is the history and incredible Neolithic sites which make the Orkney Islands very special. The main island (Mainland) of Orkney hosts a UNESCO World Heritage site which includes the breath-taking Standing Stones of Stenness, some up to 6 metres high. The nearby Neolithic Ring of Brodgar is particularly magical in the evening light. We include a Historic Scotland Explorer pass in the price of this holiday, which covers entrance to managed sites on Orkney, including Skara Brae and Maes Howe. This means that our clients can experience first-hand these wonderful, historical sites and contribute to their continued preservation by supporting the local communities involved in promoting them. Your hotel on Shetland for example dates from the 1500’s, thus is a real historical cornerstone in the area in which it is situated. Moreover, this hotel prides itself in using only the best, locally sourced produce in its restaurant. This holiday also offers clients the opportunity to visit some of Shetland's most remote, rural villages on the islands of Unst and Yell as well as other locations. This gives clients the opportunity to positively impact these local communities in terms of bringing tourism to these lesser known areas. All of our holiday packs include "Robert's Recommendations", our specific tips on places to visit, places to eat and places to shop locally, all of which have been researched by us, and many of which are off-the-beaten track. For example, the quirky bus shelter on Unst is well worth a visit! It was fantastic to see the contrast in both Isles and to see the nature, unspoilt beauty. The wealth of wildlife and to see them in a nature environment. The wealth of history and to see how the areas have evolved throughout the years. Also the possibilty of seeing the northern lights.